Heat oven to 350ºF. Place paper baking cup in each of 16 regular-size muffin cups. Make cake mix as directed on box, using water, butter and eggs. Divide batter evenly among muffin cups. Bake 15 to 20 minutes or until toothpick inserted in centre comes out clean. Cool 10 minutes; remove from pan to cooling rack. Cool completely, about 30 minutes. Frost cupcakes with frosting. Using wrapped fruit snacks, cut some with decorative scissors into 1x1/4-inch strips for streamers and punch heart shapes from some; remove wrappers. 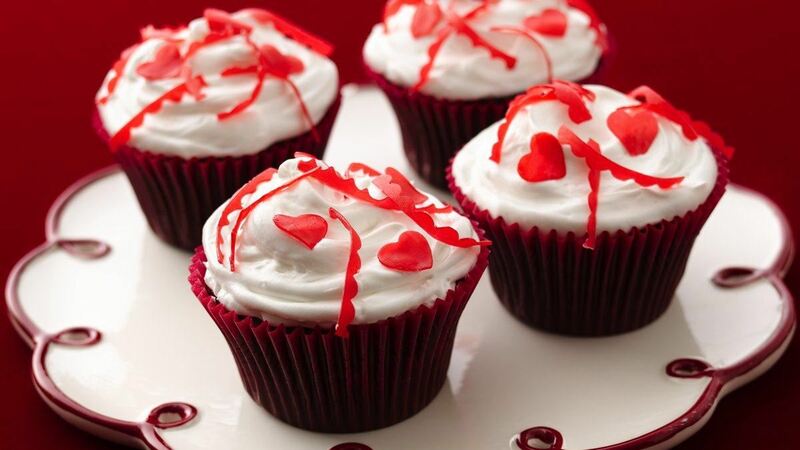 Arrange streamers and hearts on each cupcake.